Just a quick hop in this week. Here is a sneaky peeky of the third block from the journey down Briarside Lane. This block will make its debut on March 1st. Got any ideas on what it is? 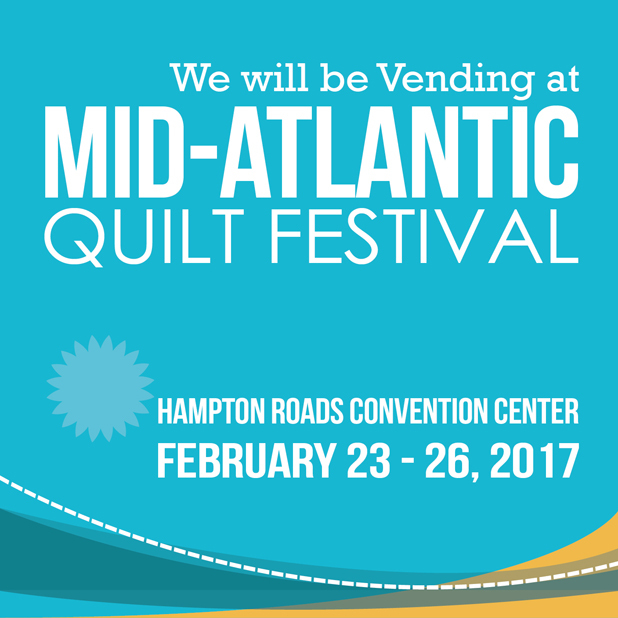 I'm headed out in the morning for five fun days vending at the Mid Atlantic Quilt Festival. Hop by and visit me! 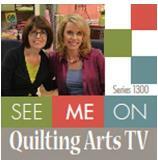 I will be in booth 1415. Have a great weekend and I'll see you next week! Hi there! Just hopping in for a quick post this week. I am running around like a crazy bunny trying to get ready for vending at the Mid Atlantic Quilt festival next week. I do hope to see you if you attend that show. I know it's going to be so much fun. Today, I wanted to share a new design with you. Well, it's actually a remake of a design I made back in 2009! Gosh did that time go by fast! I made this using wool and cottons, but you most certainly can use all cotton fabrics. It's lots of fun to make and it would look good in a variety of places depending on what fabrics you chose. I have the e-Pattern and a few Wool and Thead Kits available in my SHOP. So hop on over if you would like to make your own "Fleur de Bunny." Hugs and have a wonderful rest of your week! Well hello there! I hope your week is going well. Mine is going really, really well. In fact, I am so excited to share some news with you! I have been accepted as one of 123 teachers at this years Houston International Quilt Festival! This has been a dream of mine for a very long time and I haven't stopped doing the happy bunny dance! 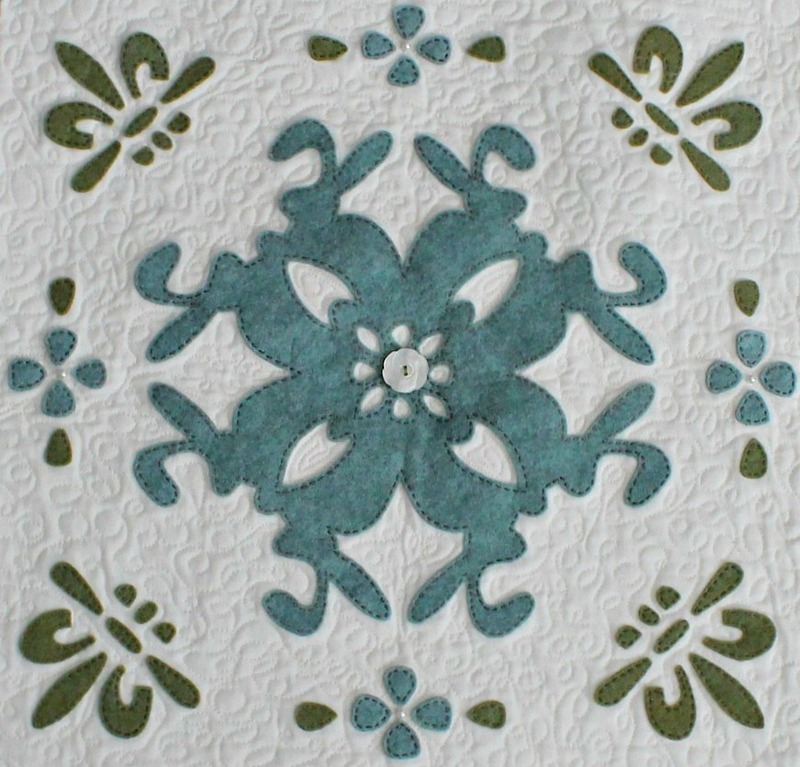 I started teaching the art of quilting back in 1995 at a local quilt shop. I taught nights and weekends, for the most part, to support my fabric habit. My most popular class was Quilting 101. 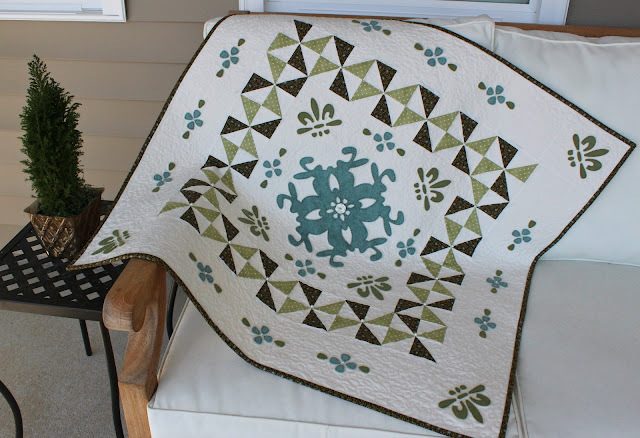 This was a beginning quilt class in which I would teach fabric selection, design layout, how to use the tools of the trade, piecing, needle turn applique and machine quilting. I designed the quilt for my class as well, which was a medium sized wall hanging called "Star of my Heart." In 2000, I met a wonderful lady from England, Sallieann Harrison. She and her husband were living in the States for a few years for her husband's work. Sallieann was one of those students who was chock full of incredible talent. 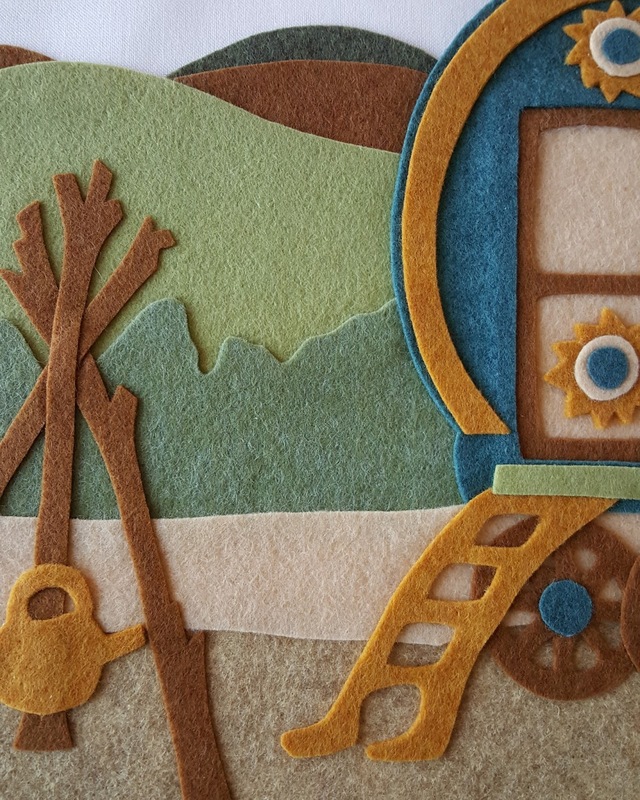 Her quilts, use of color and embellishments blew me away. 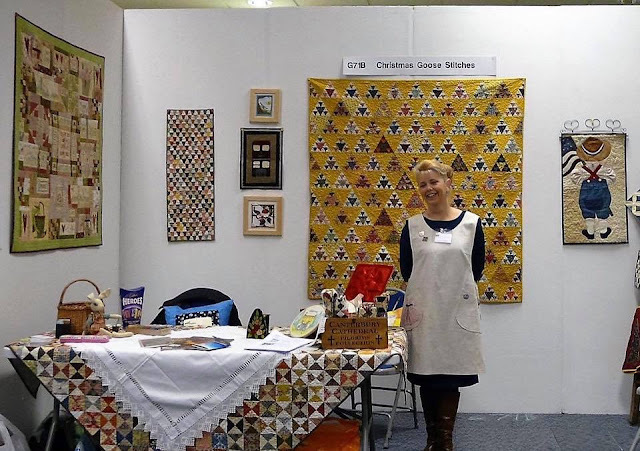 I knew she would go on to be a very creative quilter. Well, this past November after twelve years since we last saw each other, Sallie and I reunited in Houston. It was so much fun to catch up on all our creative adventures that we had been on over the years. She thanked me for inspiring and encouraging her with her quilting as she has gone on to inspire and encourage her own students as a quilt teacher in England. I couldn't be more proud of Sallie. I knew way back from that first quilt class in 2000 that she would be a star and indeed she is. 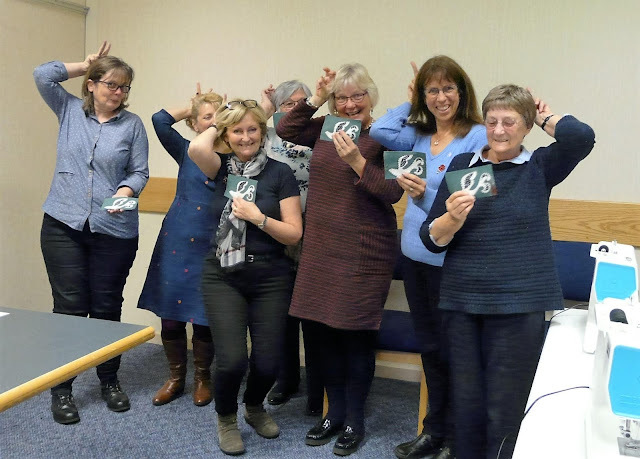 Here she is with her students and my Dove postcard from my Postal Fusions Christmas collection. Everyone did bunny ears for me! LOVE! Teaching and inspiring others to be creative has forever been my passion. Through many challenges and hardships in my life, I can truly say I have been blessed by falling down this rabbit hole. 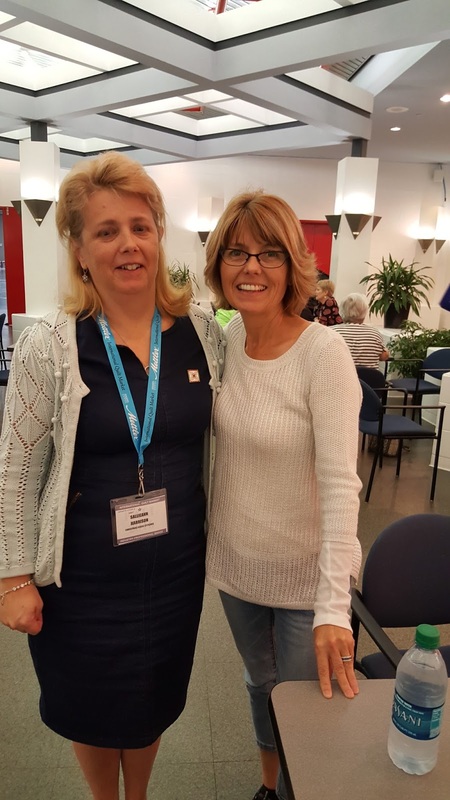 I hope to see you in a class one day and if you are in Bristol, UK, Sallie would love to see you too! We have come to the next stop on our journey down Briarside Lane! 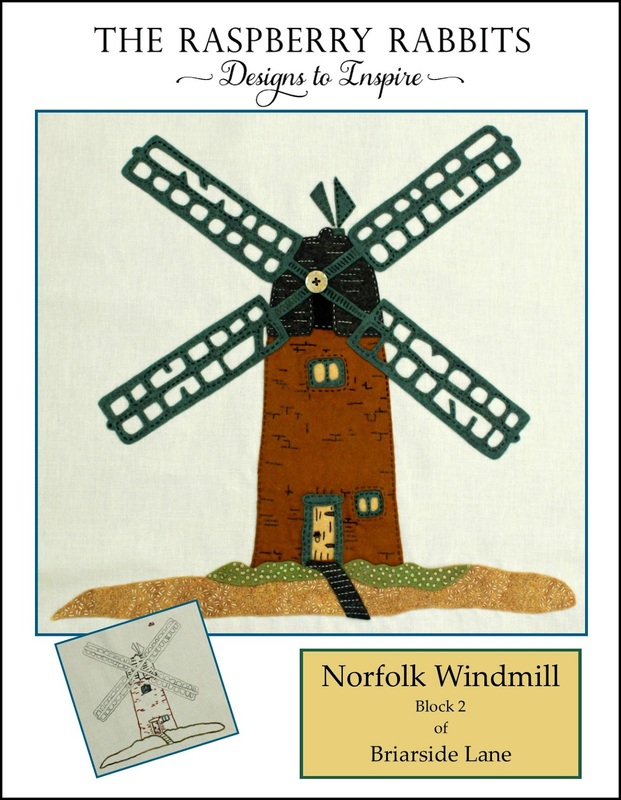 This month we are excited to bring you the Norfolk Windmill. On a clear, cold early morning in late autumn, the salt marsh is waking to the sound of birdsong. The reeds have turned from bright gold to a tarnished hue. We can hear the sails of the old windmill creak and grind. Many of the struts are lost and broken, but still the windmill turns. Suddenly, a movement catches our attention; to our right, a barn owl flies home from its nightly hunt. It glides, ghost like, across the winding river. We stand, transfixed, watching this feathered beauty pass across the cycle of the great sails. A single beam of sunlight pierces the cloud above. For just a moment, the worn, old bricks glow and the giant windmill gleams, standing proudly against the soft colors of the autumn marshland. Jules is fascinated by windmills. Her favorite can be seen on a hike that crosses the salt marsh at *Cley, an eastern seaside hamlet located in the county of Norfolk. Walking this way for the first time, Jules had an amazing experience. As the majestic windmill came into view, the white shape of a barn owl flew across the footpath in front of her, a ghostly silhouette beneath the sails of the mill. It was an instance of pure magic and one she has never forgotten. For those who know of the beautifully renovated Cley Mill, don’t be confused. 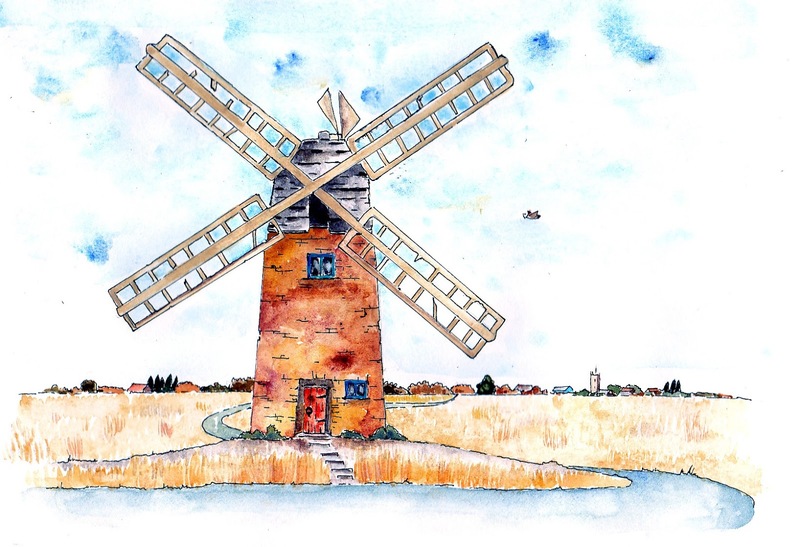 The Norfolk Windmill remains untouched, harking back to an older, more romantic time! Here is Jules original watercolor piece. Isn't it beautiful? 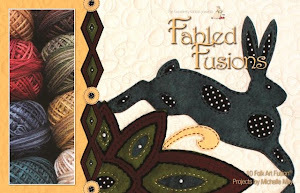 I must say that I am having so much fun creating wool and embroidery versions of her incredible work. 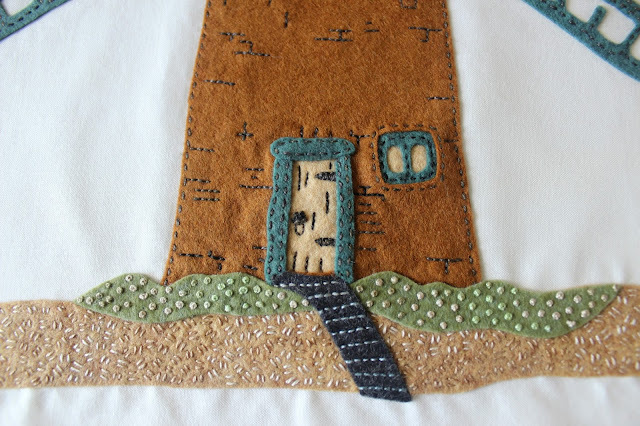 Just like Bumblebee Cottage, there is a FREE embroidery version of this design. 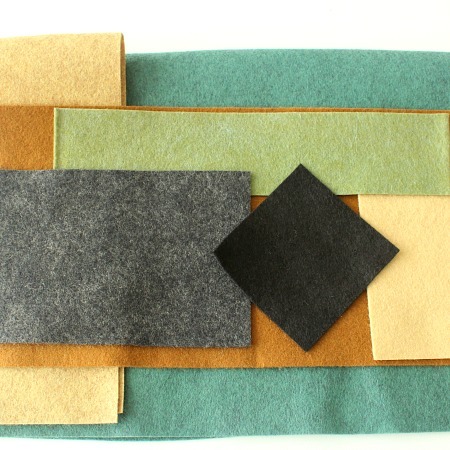 We have a National Nonwovens wool blend kit available for this block. 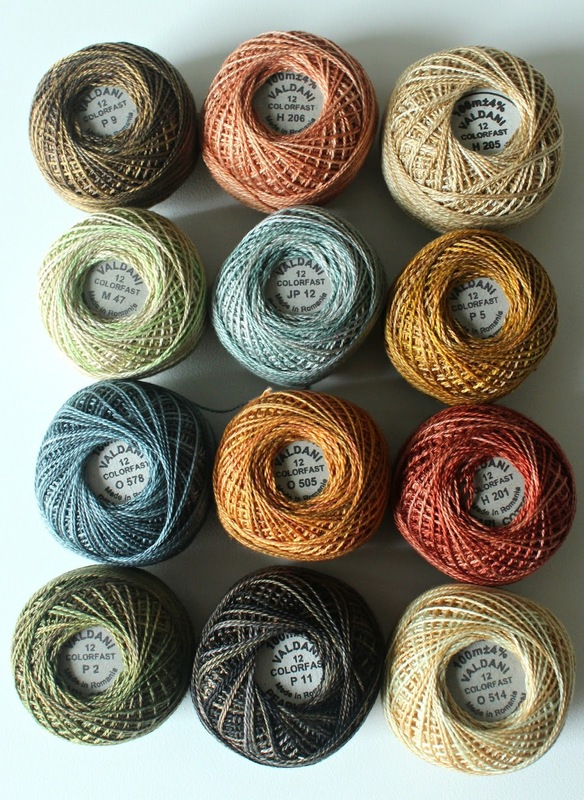 and we also have the Briarside Lane Valdani perle cotton collection, which includes all the colors we will be stitching with on this adventure. The e-Pattern, Wool kit and Valdani kit are all available in the SHOP. So hop on over! Please feel free to post your creativity on The Raspberry Rabbits Facebook Page. It's been so much fun seeing what everybunny has been inspired to create! Be sure to visit the Briarside Lane tab at the top of the blog for more inspiration. 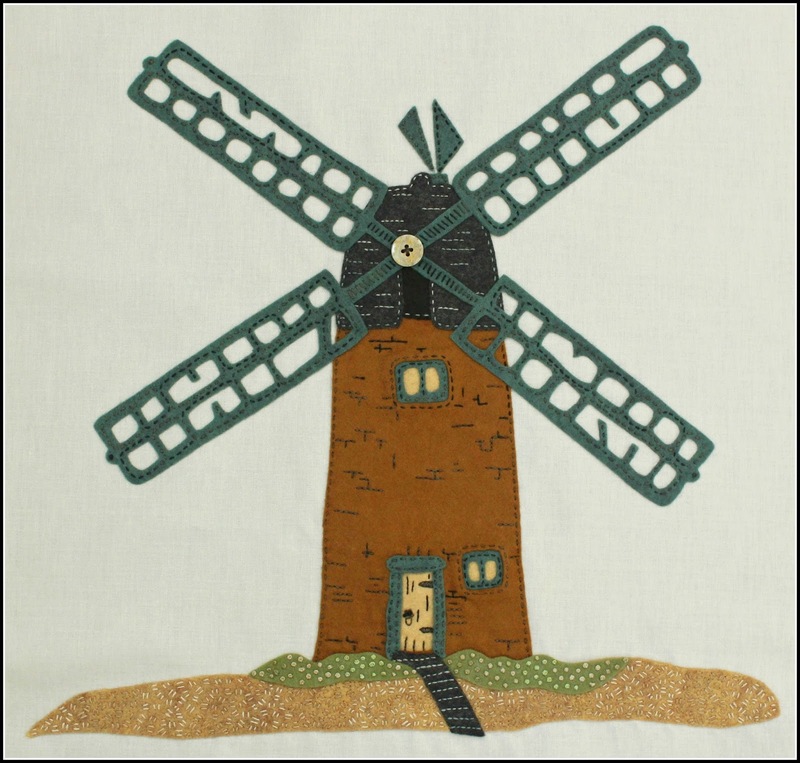 We hope you have enjoyed your visit to the Norfolk Windmill. Our next stop down Briarside Lane will be March 1st when we debut the third block of our journey. 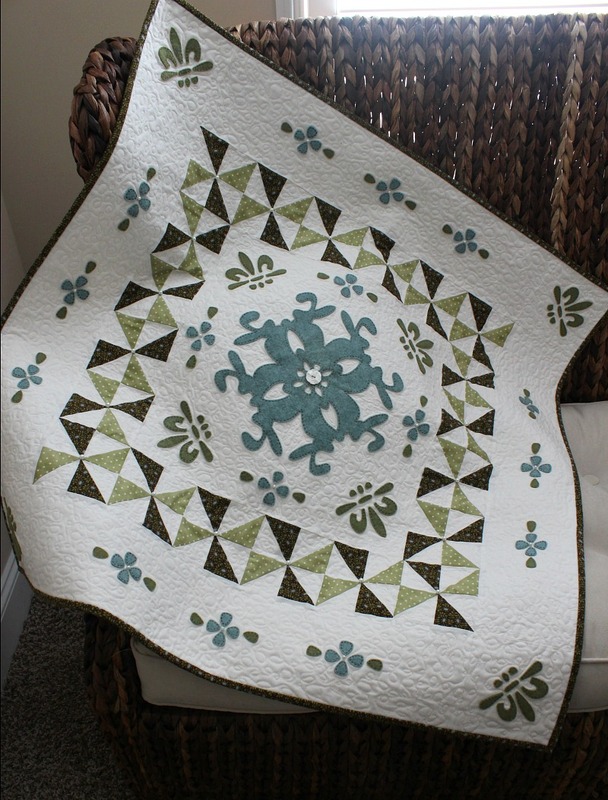 Until then, hoppy stitching!